Welcome to Polaris Quad! We are the UK’s #1 Polaris Dealer! Visit us for all your POLARIS requirements! Looking for an off-road vehicle, look no further than Polaris Quad! Whether you are looking to invest in a new POLARIS Ranger, a side x side UTV or a more sporty Sportsman? Polaris Quad carry a wide variety of stock, besides stocking and selling the latest and newest machines, we stock a wide variety of more affordable, secondhand, used, part-ex machines. We don’t just sell Quads and Atv’s, we are passionate about POLARIS as a brand, backed up by a great parts system and aftersales service we are able to offer you the Complete Package! Looking to invest in a Quad? want to road legalise a machine? Have questions, but dont have the answers? Contact Us for UNBEATABLE PRICES, backed up by our extensive knowledge and a market leading Brand! 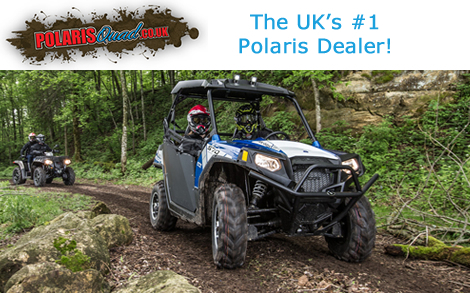 Polaris Quad - The UK's #1 Polaris Dealer! Your complete online store for all your Polaris Quad requirements! Our extensive stock ranges includes - the Polaris Ranger, RZR 170, Kids Quads, Polaris Brutus, Secondhand Quads, POLARIS Ranger & so much more. Look no further if you a shopping for a new POLARIS Ranger or just need some spare parts for your Quad or Utility Vehicle.